Specific, high-risk locations, such as areas under windows, roof flashings and decks are tested for moisture using an electrical resistance-type probe meter. 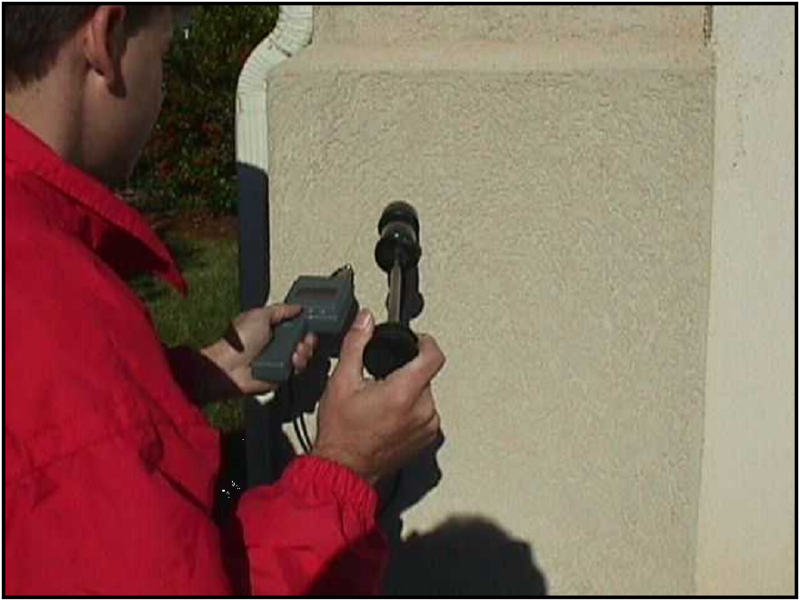 Additionally, the surface of EIFS is scanned under high-risk locations using a Tramex Wet Wall Meter. Any locations that register an elevated reading with the Tramex Wet Wall Meter must be probed using the electrical resistance-type probe meter. The meters are calibrated at an appropriate test location. The location is photographed and indicated in the report. The calibration procedure is repeated for each side of the home. This step is intended to determine the accumulated moisture content of the sheathing and/or frame for each elevation of the home and to provide a baseline for comparing readings to other locations on the home. To probe for a moisture reading, the inspector will first drive two steel pins through the EIFS into the wall. The inspector should note whether the substrate or framing seems firm or soft, keeping in mind that different substrates may be used on the home. The pins are withdrawn, and then replaced with the Teflon-coated probes of the Delmhorst meter. The readings are recorded and we note the “feel” of the framing or substrate wood. 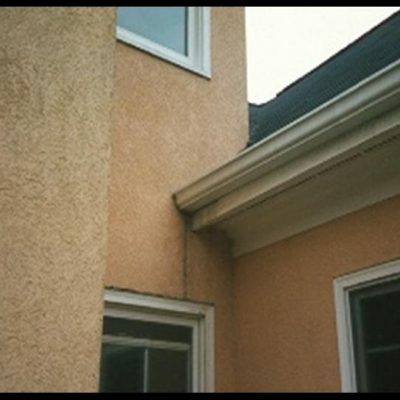 The small inspection holes are sealed with an appropriate sealant, preferably matching the color of the EIFS as closely as possible. An electrical resistance-type meter (such as the Delmhorst J-2000, BD-2000, BD-2100 or similar meter) with at least 3” probes should are used to determine relative moisture levels in the substrate or framing wood. Any reading 19% and above is considered above normal. We double-check all high readings. Regardless of the moisture level, we always note the stability of the framing in the area tested. Some areas with low moisture readings may still have damage to the framing. 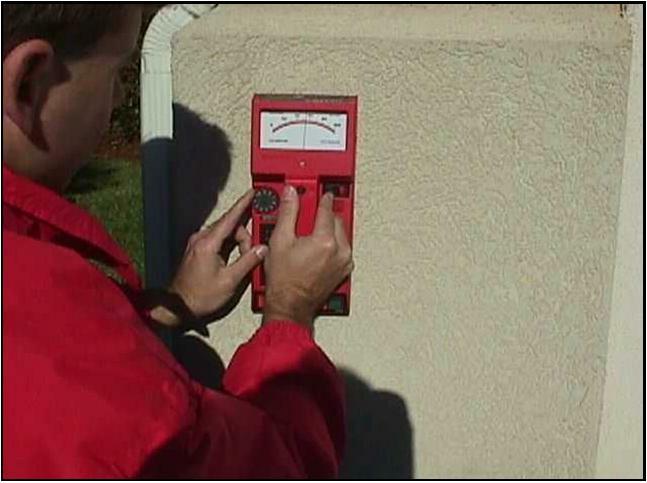 The Tramex Wet Wall Meter works well for determining the size of a known high moisture area. 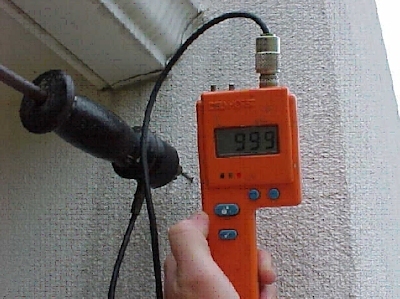 The Tramex Wet Wall Meter cannot be used to determine a moisture level. It can only be used to help find potential areas of high moisture and to “map” the relative size of a high moisture area. The Tramex Scanner will give false positive readings when placed over nails, pipes, wiring or other metal elements of the wall. Any high reading detected by the Tramex Scanner MUST be verified using an electrical resistance-type meter, such as the Delmhorst BD-2000 with 3” probes. The Tramex Wet Wall Meter can be used to “map” the size of areas of high moisture once the area has been proven to have high moisture levels using an electrical resistance meter. Holes are drilled through the Hard Coat system and electrical resistance-type meter (such as the Delmhorst J-2000, BD-2000, BD-2100 or similar meter) with at least 3” probes are used to determine relative moisture levels in the substrate or framing wood. Any reading 19% and above is considered above normal. We double-check all high readings. Regardless of the moisture level, we always note the stability of the framing in the area tested. Some areas with low moisture readings may still have damage to the framing. We use the following inspection protocol for qualifying a hardcoat stucco homes. 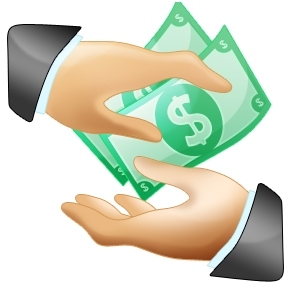 We first, determine the type (1 coat or 3 coat) system on the home and identify the substrate. Joist band at closest floor line. Show close-up photographs of the flashing or if it is missing. 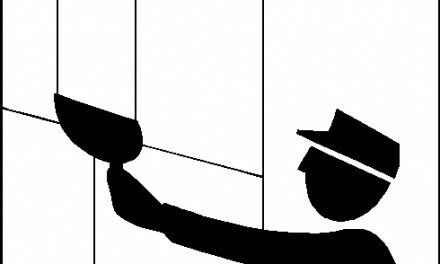 Under double-hung or single-hung windows, probe windows directly below one of the miter joints and/or mullions. Also, probe test and document all windows that are showing signs of possible moisture intrusion and/or wood rot. Note on the report whether the area probed “feels” firm or soft when probed. If the substrate is soft (ie. deteriorated), map the damaged area and test the rim joist for damage. Under all casement, custom, oversized or fixed placement windows, probe under each miter joint and/or mullion joints. Keep in mind that fixed placement windows sometimes have glazing failures that allow moisture intrusion along the entire length of the window and not just at the miters.